Saturday, March 30, 2019 – 12:00 P.M.
Mary K. Maddox, age 93, of Somerset, Kentucky, passed from this life on Wednesday, March 20, 2019 at her home. She was born on August 18, 1925 in Grayson, Kentucky, daughter of the late Lewis and Maggie Hollingsworth Easterling. She was a member of HighPoint Cumberland Presbyterian Church and was a retired nurse’s aide. 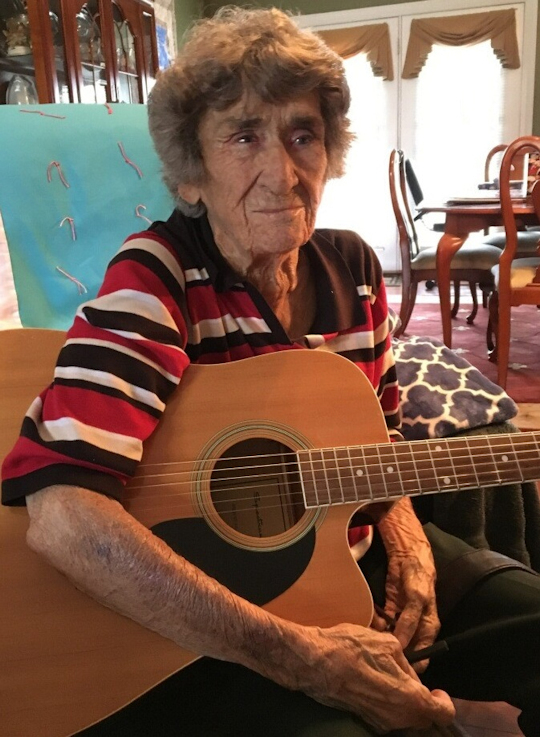 She loved gospel music and loved playing her guitar. She was preceded in death by her parents, Lewis and Maggie Easterling; her husband Everett Maddox; seven brothers, Orville, Joseph, Ray, Fred, Rubert, Hubert and James; and four sisters, Bessie Young, Rena Liebbe, Mildred Easterling and Faye Rucker. She is survived by two daughters, Sandra K. (and James) Beaven of LaGrange and Gwen (and Mike) Adams of Somerset; two grandchildren, Jason (and Traci) Adams of Lafollette, TN and Kathy Adams of Somerset; and four great-grandchildren, Tory Adams, Jason Adams, Jr., Charlie Adams and Cole Fugate. A Celebration of Life Service will be held at 12:00 p.m. on Saturday, March 30, 2019 at HighPoint Cumberland Presbyterian Church, 190 Longview Dr. Somerset, KY 42501. Visitation will begin at 10:00 a.m. on Saturday at the church until service time. Rev. Keith McKim, Rev. John Contini and Rev. Mike Adams will be officiating. In lieu of flowers the family requests that donations be made to Hospice of Lake Cumberland or HighPoint Cumberland Presbyterian Church. Southern Oaks Funeral Home is entrusted with the arrangements for Mary K. Maddox.